The benefits of eSource – where trial data remains electronic from start through data lock – are well understood. They include the elimination of transcription errors (shown by Nham et al to be 10x more accurate), reduction in duplicitous effort and monitoring requirements, and easier query resolution. With clinical EHR adoption nearing 90%, digital data points should be easy to come by and eSource should be a step away, so why haven’t trials swiftly transitioned to eSource? Barriers to eSource are more complex to understand than its benefits. They can be considered in three categories. Behavior change: eSource requires digital data entry at the bedside, often through a tablet. Some clinics resist adding a tablet to their workflow. Though it can be due to techno-phobia, more often it’s because some other tablet activity is already required for the clinic’s EHR system, and this creates a duplicate task. Technical barriers: Integration with the clinics’ EHR systems could make eSource easy; trouble arises when a sponsor might need to integrate ten different EHR systems for a 20-site study. Even when integration is technically possible, getting site IT participation within a set startup timeline is unlikely. This problem compounds when histories from referring clinics are required. Since each site in this study will surface at least one of these three barriers, what are sites doing today to get around them? Sites turn to paper “shadow charts,” where printed versions of EHR records, emails, and digital faxes act as ways to assemble a record that would normally be fragmented across different data sources or locked behind a policy-restricted EHR. So what’s to be done? One approach could be to require behavior change, create technical integration, and create policy change. Another is to bring paper shadow charts into a digital workflow. 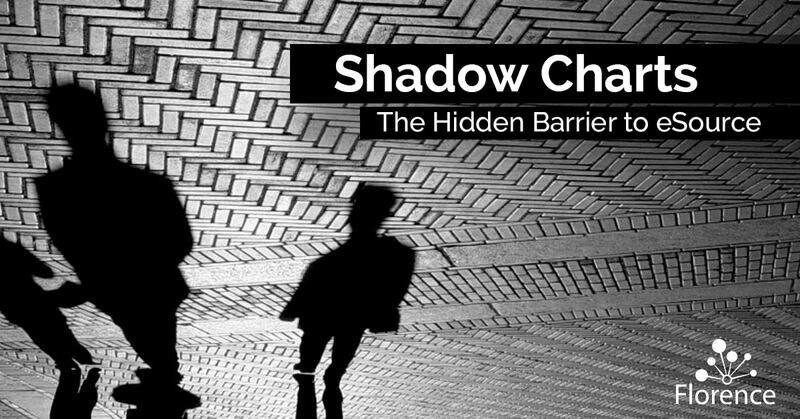 Digitizing shadow charts is easier than you might think. Most shadow charts are printed from a digital source, and that same printing step can be replaced with a digital step. This avoids barrier #1, the behavior change. Further, this approach sidesteps the integration and policy barriers as well. Users create and manage individual documents rather than rely on weighty integration and release policies that align with those that have been long established in the paper world. Florence Healthcare has built the world’s best system for moving past Paper Shadow Charts and creating a bridge to eSource. Learn more about how sites are transitioning to eSource.